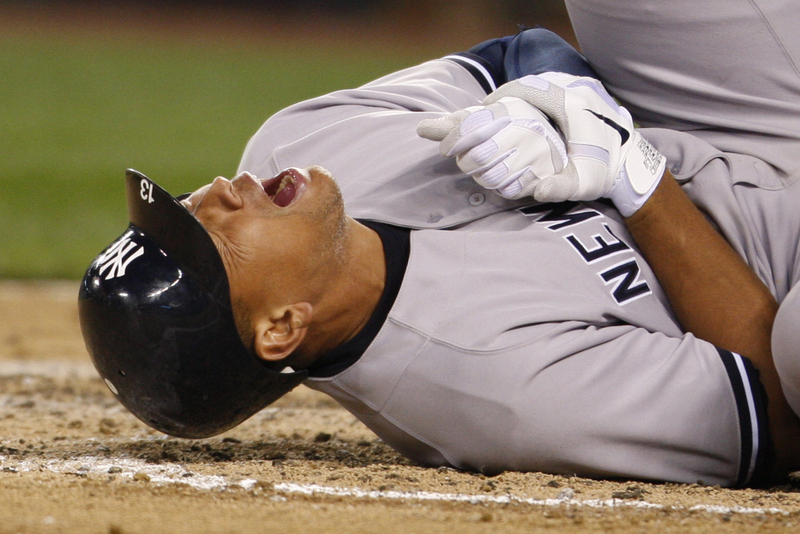 (AP) SEATTLE - Even as Alex Rodriguez writhed on the ground in pain, he didn't believe his left hand was fractured. Turns out A-Rod was wrong, and now the Yankees will be without another of their star players. "It's difficult. Tough break," Rodriguez said in almost a hushed tone after New York lost to the Seattle Mariners 4-2 Tuesday night. Rodriguez broke his hand when he was hit by an 88 mph changeup from Felix Hernandez in the eighth inning. He went down in considerable pain. The Yankees said he has a non-displaced fracture of the hand, and there is no timetable for his return. He will be placed on the disabled list and will remain in Seattle with the team for the series finale Wednesday. Eric Chavez, Rodriguez's replacement at third base, had a similar injury in 2004. He was out for about five weeks. "You hate to see a guy go down on something freak like that," Yankees' first baseman Mark Teixeira said. "I had a weird feeling it wasn't good." Rodriguez was the last of three Yankees to get plunked in a five-batter stretch and that ended Hernandez's night. He also hit Ichiro Suzuki and Derek Jeter with pitches. While not sharp, Hernandez had allowed only Curtis Granderson's first-inning home run and worked out of jams in the fourth and fifth innings. The sudden loss of control started when Hernandez hit former teammate Suzuki on the foot with a breaking ball in the seventh. He then hit Jeter in the arm to open the eighth and completed the trio when his 3-2 pitch to Rodriguez tailed up and in. None of the Yankees felt any of the wayward pitches were intentional and Hernandez was apologetic. "It was getting away. It was a changeup to A-Rod," Hernandez said. "I feel bad. Rodriguez has been durable this season after failing to play at least 150 games since 2007. He had played in all but three of the Yankees 97 games this year after playing just 99 last season. But A-Rod's production has fallen way off. He was hitting just .274 with 15 homers and 44 RBIs entering Tuesday's game, although he was hitting .328 over his last 16 games. With the acquisition of Suzuki on Monday to take over for injured left-fielder Brett Gardner, the Yankees appeared to be done with any big moves before the non-waiver trade deadline in a week. Losing A-Rod, though, could change that. New York's main option at third base now is the injury-prone Chavez. "We'll just have to talk about it and see what we come up with," Chavez said. "Whatever he asks me to do I'll just give it my best shot." Rodriguez joins Andy Pettitte, Mariano Rivera, Michael Pineda and Gardner as key pieces of the Yankees puzzle who have missed time with injuries. Whatever the time-frame on Rodriguez, it's one more obstacle for the Yankees to overcome. They do have the luxury of a seven-game lead in the AL East, even with their recent West Coast slump. "You find out how good you are. Other guys are going to have to step up. We can't feel sorry for ourselves because no one else is going to," Jeter said. "It's going to be a challenge, but it's been a challenge for all the injuries we've had this season." Lost in the concern over Rodriguez was starter Freddy Garcia (4-4) looking more like the 2001 version that won 18 games with the Mariners and was an All-Star. Garcia struck out a season-high eight and retired the final 15 he faced before being pulled with one out in the eighth. But Garcia was pitching from behind after the Yankees offense failed in getting to Hernandez in both the fourth and fifth innings when New York had runners in scoring position and couldn't get clutch hits. Teixeira added a sacrifice fly in the eighth, but reliever Lucas Luetge struck out Raul Ibanez with two on to end the threat. That was all secondary to what the absence of Rodriguez will mean for the Yankees. "We're going to have to change it around a little," manager Joe Girardi said. "He had been swinging the bat really good too. We've had to overcome some things so far, we're just going to have to continue to do it." NOTES: Rodriguez recorded his 2,000th career strikeout when he went down swinging in the sixth inning on a changeup from Hernandez. ... Suzuki was hit by a pitch for the first time since July 20, 2010. ... Hernandez hit three batters in a game for the third time in his career.